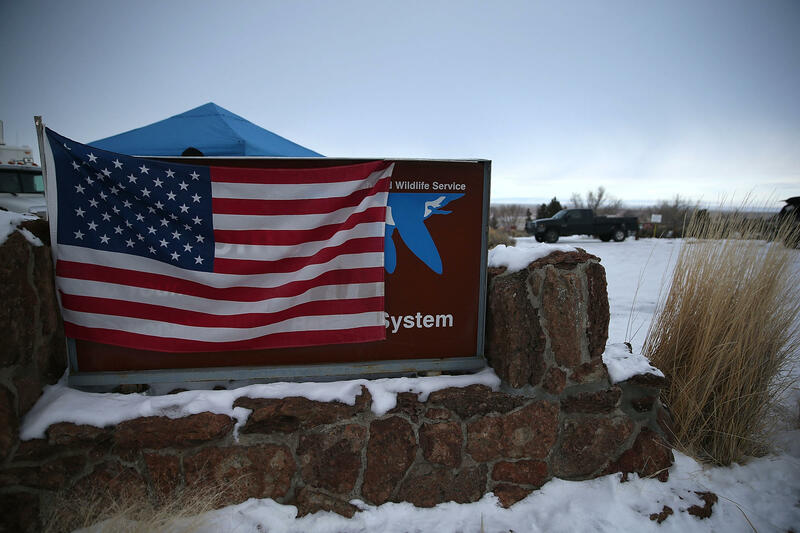 A U.S. flag hangs over a sign in front of the Malheur National Wildlife Refuge headquarters on Tuesday near Burns, Ore. An armed group has occupied the refuge since the weekend. 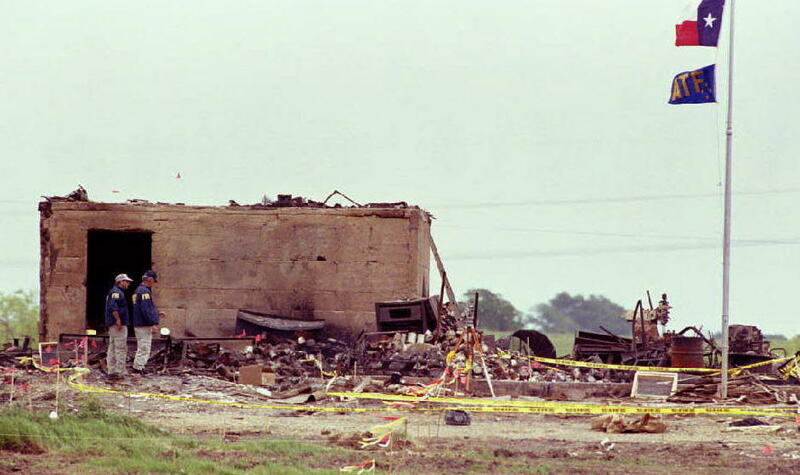 The Texas and Bureau of Alcohol, Tobacco and Firearms flags fly at half-staff over the only structure left standing after a fire destroyed the Branch Davidian compound on April 19, 1993, in Waco, Texas. The blaze ended a 51-day standoff between federal agents and the cult lead by David Koresh. But does he expect that kind of assault — with helicopters and guns? No, he says. "At this point in time and juncture, nobody wants anything bad to happen on any side," he says. And, in fact, that seems to be the growing consensus here — that law enforcement has decided to give this time. Steve Ijames is a retired police chief who has decades of experience training SWAT teams and consulting on standoffs. He says the decision to raid a site isn't tactical. "There's no doubt that the government would have the tactical ability to exert their will on those men," Ijames says. "The question is how willing are we, those making decisions, to accept potential negative outcomes?" Ijames says the balance shifted dramatically after deadly government raids of the 1990s, such as the 1992 Ruby Ridge incident in Idaho involving white separatist Randy Weaver, and a 51-day standoff at David Koresh's Branch Davidian community near Waco, Texas, in 1993. Now, there's less appetite for force, especially in a situation like this one in Oregon — it's a remote site, with no hostages, no children, and where the occupiers say they're not even damaging government property. But he says sentiment could shift, depending on the labels that the media use to describe the occupiers. "If we demonize them, if we make them domestic terrorists, then the political ability to deal with them harshly increases," Ijames says. It also seems clear to him that federal authorities have made a strategic choice to stay behind the scenes. It's their jurisdiction, but they're also the political target in this: Federal authority is exactly what these armed men oppose. So the emphasis has been on local law enforcement. Sheriffs and their deputies have been flocking to the area from across Oregon to help. Right now, that help consists of more patrols in Burns, the town half an hour from the refuge. One visiting deputy told NPR that there's a worry that some of the occupiers could come into town to cause trouble. They're still free to come and go — law enforcement has not blocked any roads. That's a strategic decision, too, to prevent creating the impression of a siege. But the policy could also change, if many new supporters head to the refuge to join the occupiers. That's exactly what Ammon Bundy and his supporters out at the wildlife refuge are hoping for. A couple of pickup trucks pull up, and the drivers are greeted enthusiastically by Ryan Bundy, one of the leaders of the occupation. He says they're local ranchers, come to support this movement. "They're just ranchers here, they're neighbors," Bundy says. "They're here to help us out." Right now, law enforcement seems willing to let Bundy's group wait in the cold and snow to see just how many supporters show up — to stay. Armed protesters still control a group of buildings at a federal wildlife refuge in Oregon. It's the fourth day of their occupation. And here's a question many people have been asking. Why is there still no sign of law enforcement at the site? NPR's Martin Kaste explains. MARTIN KASTE, BYLINE: There's a kind of tactical vibe at the Malheur National Wildlife Refuge where the men who've blocked the driveway address each other with radio codenames such as Infidel and Rogue. And they talk about maintaining OpSec. That's operational security to civilians. One of the men, who won't give his name, says if law enforcement shows up here, it'll show up big. UNIDENTIFIED MAN #1: You'll know when it happens because you'll hear the helicopters. KASTE: But does he expect that kind of assault, with helicopters and guns? He says no. UNIDENTIFIED MAN #1: At this point in time and juncture, we're just fine. Nobody wants anything bad to happen on any side. KASTE: And in fact, that seems to be the growing consensus here - that law enforcement has decided to just give this time. STEVE IJAMES: Well, you better bring your lunch. I think you'll be there a while. KASTE: That's Steve Ijames. He's a retired police chief who has decades of experience training SWAT teams as well as consulting on standoffs. He says the decision to raid a site isn't a tactical one. IJAMES: There's no doubt that the government would have the tactical ability to exert their will on those men. The question is, how willing are we, those making decisions, to accept the potential negative outcomes? KASTE: Ijames says the balance shifted dramatically after the deadly government raids of the 1990s, such as Ruby Ridge and Waco. There's less appetite now for force, especially in a situation like this one in Oregon. It's a remote site with no hostages, no children and where the occupiers say they're not even damaging government property. But he says sentiment could shift depending on the labels that the media use to describe the occupation. IJAMES: If we demonize them, if we make them domestic terrorists, then the political ability to deal with them harshly increases. KASTE: It also seems clear to him that the feds have made a strategic choice to stay behind the scenes. It's their jurisdiction, but they're also the political target in all this. Federal authority is exactly what these armed men oppose, so the emphasis has been on local law enforcement. Sheriffs and their deputies have been flocking to the area from across the state of Oregon. Brian Wolfe is sheriff of neighboring Malheur County. BRIAN WOLFE: Anytime another sheriff in Oregon needs help and they call for help, all the sheriffs will go. And as long as it's lawful request, we'll go and help. KASTE: That help right now consists of more patrols in Burns, the town half an hour from the refuge. One visiting deputy told NPR that there's a worry that some of the occupiers could come into town to cause trouble. They're still free to come and go. Law enforcement has not blocked any roads. That's a strategic decision, too, to prevent creating the impression of a siege. But that policy could also change if a lot of new supporters headed to the refuge to join the occupiers, and that's exactly what they're hoping for at the wildlife refuge. RYAN BUNDY: Oh, hey, how you doing, brother? UNIDENTIFIED MAN #2: Good. How're you? KASTE: As a couple of pickup trucks pull up, the drivers are greeted enthusiastically by Ryan Bundy. He's one of the leaders here. He says they're local ranchers coming to support the movement. BUNDY: They're just ranchers here. They're neighbors, and they're coming to help us out. KASTE: But what are they doing? I mean, what are they going to do? KASTE: So they're going to stay. BUNDY: They're - well, they might go. KASTE: Right now, law enforcement seems willing to let Bundy's group wait in the snow and the cold to see just how many supporters show up to stay. Martin Kaste, NPR News, Hearney County, Ore. Transcript provided by NPR, Copyright NPR.